Just like fashion, jewelry styles and trends come and go, often returning for a newer, more modern revival. What’s old is new again, and the up-surging demand for vintage and vintage-inspired wedding bands has inspired many couples to choose vintage cut diamonds to accent the ring that seals their marriage vows. The marquise cut is a historic gem cut, making the marquise a natural choice for vintage designed wedding bands. 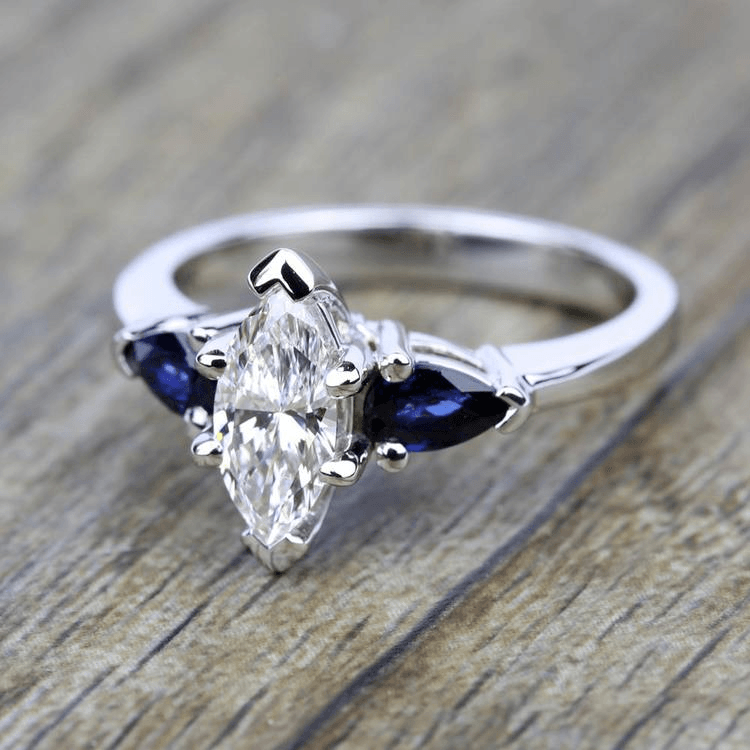 With the exploding popularity of vintage designs, the marquise has once again taken the spotlight as one of the most popular choices for accent stones in bands. 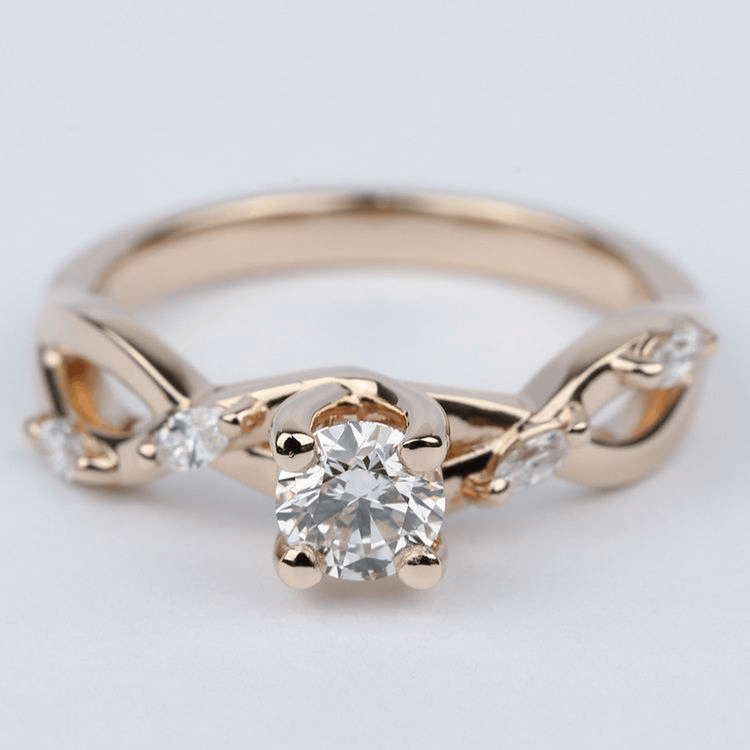 The shape is so popular that it has even inspired intricate details within band designs. 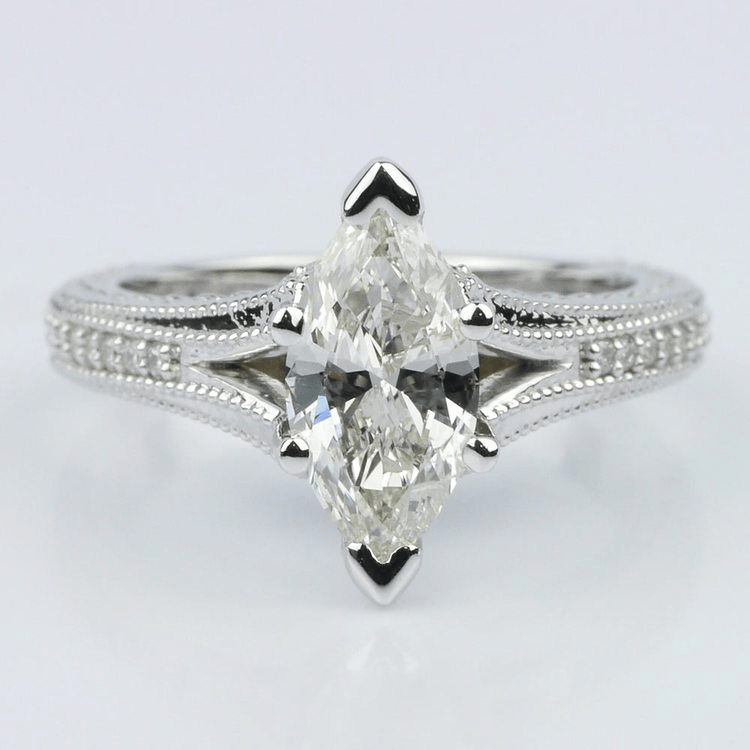 The marquise is a perfect choice for vintage or vintage-style wedding rings. It looks most regal when placed in designs that accentuate the unique shape of the cut. Pull luxurious details from the rich, regal beauty of vintage floral brocade fabrics to create a wedding band set with the whimsy and charm of the past. Etched floral details along the band keep the ring simple and elegant while allowing the small marquise stones to create elegant accents. Use white marquise-shaped gemstones or diamonds to create rose-bud accents against intricate winding diamonds and white gold stems. A custom wedding band may be designed with larger carat marquise accent stones to weave a remarkably impressive brocade-style wedding ring. Delicately-sized marquise gemstones, like those in the Twisted Petal diamond ring capture a refined and subtle style for a sweet vintage floral brocade throwback. For a sleek style, and to recreate the cording of brocade elegance, select a wedding band with an Infinity Twist. In an infinity twist, round diamonds twist and curve into large marquise shaped designs and the ring features a quarter-carat of round diamonds. 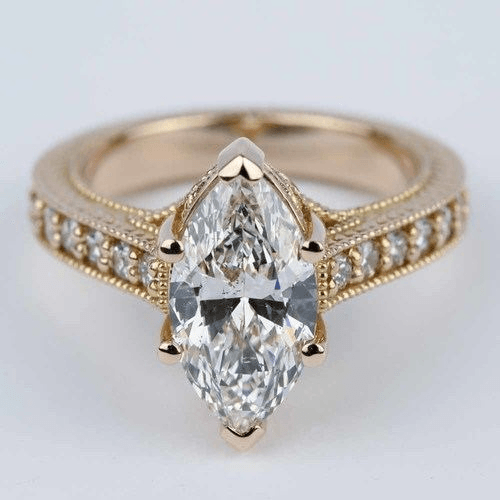 Marquise stones grace many vintage wedding rings from the Art Deco period. The exquisite shape allows the marquise to integrate into the intricate geometric details that were hallmarks of Art Deco designs. Create Art Deco vintage-inspired wedding rings using the marquise shape as the focal point of the ring. Play with color by adding gemstones and side stones of other shapes to complement the marquise pattern and to add geometric symmetry to the design. This will give it an authentic Art Deco statement. For a refined Art Deco appeal, you can alternate round-cut diamonds with marquise diamonds for a band with a line of flapper-infused elegance Or,if you prefer, mix in round or marquise onyx stones for a dark drama. When creating Art Deco wedding band designs, keep stone sizes similar. Balance is ideal for a clean look and to maintain optimum geometric symmetry. The Bezel Wedding ring can be customized to create an alternating Art Deco pattern of bezel set marquise stones and round brilliant diamonds. Set the band in white gold, yellow gold or platinum. Choose birthstones or other gemstones (like onyx) to add a personal touch to the ring. Rose gold has enjoyed a modern resurgence—and has even become a popular color for tech devices—but the metal still maintains its vintage appeal when used in jewelry. For subtle vintage inspiration, set small Marquise diamonds in a pave setting within a rose gold band. The warm blush of rose gold was popularly used during the Victorian Era and the color reflected the innocence and splendor of that time period. Customize this French Pave wedding ring with a royal marquise upgrade by swapping out the round brilliant stones for horizontal set marquise stones. The flushed beauty of rose gold is enhanced with multitudes of round diamonds set within marquise shaped designs; this can be seen in Brilliance’s Florida Ivy pattern (pictured above). This delicate look provides the beautiful shape of the marquise with the dazzle of four classic marquise diamond accents. 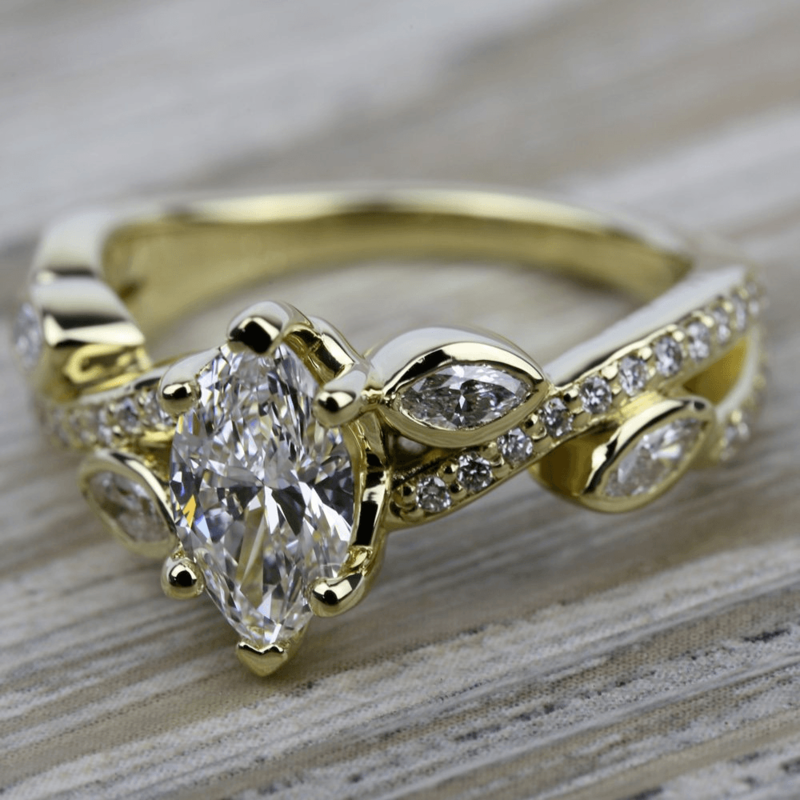 Use the engagement ring style to inspire a romantic matching wedding ring. Milgrain etchings and beadwork paired with intricately detailed designs are hallmarks of Edwardian vintage jewels. Spare no expense with details and diamonds for an exquisite Edwardian-inspired wedding ring with the Marquise as the regal star. Use Milgrain beadwork to embrace a row of clear white marquise diamonds. Add more milgrain details to line a floral border carved within the band of the ring for a delicately dazzling Edwardian-inspired ring. 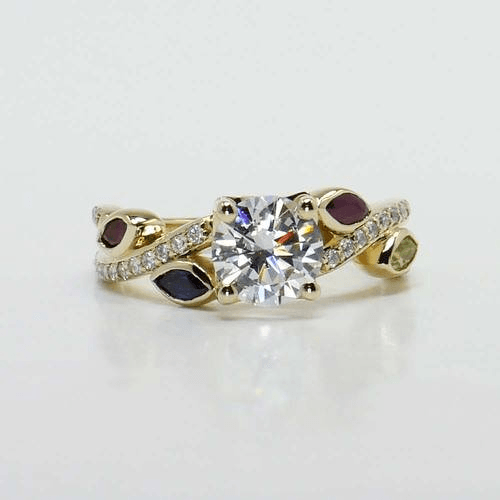 Select white gold or platinum to enhance the flawless color of the stones. The design of this engagement ring provides an Edwardian muse to help create an elegant wedding band. Customize an Edwardian masterpiece with etched milgrain marquise shaped designs decorated with white diamonds or colored gemstones. 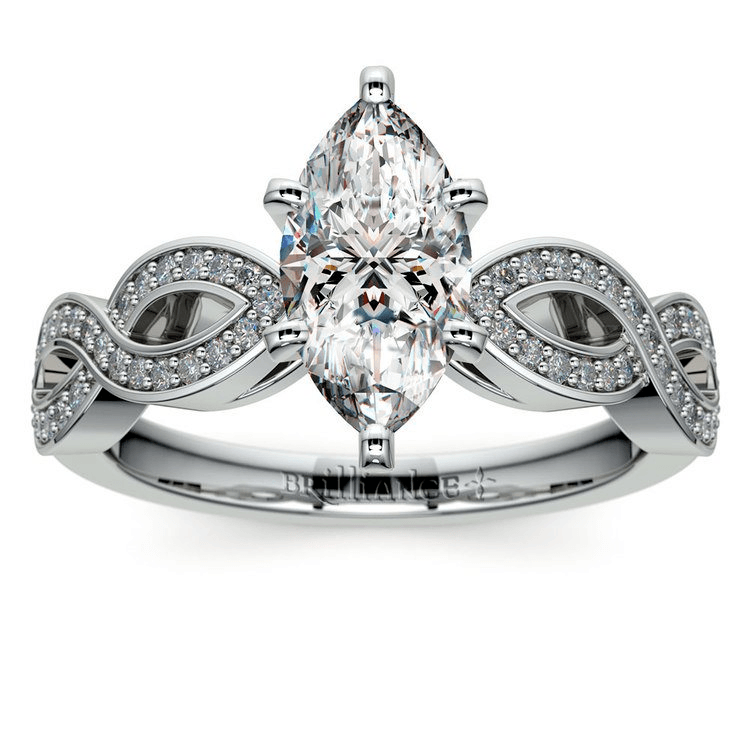 The Edwardian Style engagement ring shows the antique allure of marquise cut designs. A matching band may be designed to reflect personal style. Marquise stones and designs elevate the vintage-inspired elegance of a wedding ring. Use the uniquely shaped cut to add geometric appeal to Art Deco designs and to create an authentic antique appeal in Edwardian or Victorian inspired bands for a reigning touch of vintage infused Brilliance.